Robert Cantu helps lead a BU brain injury research center. 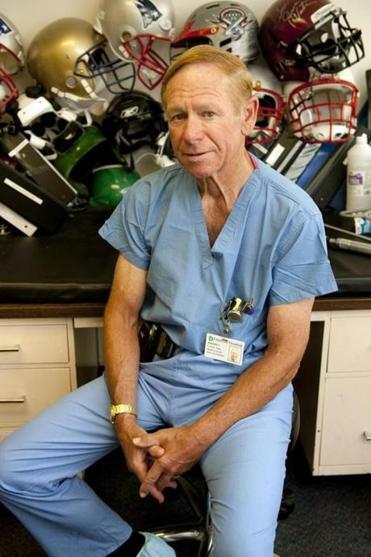 He is America’s concussion doctor, a pioneer in the fight against sports-related brain damage. Dr. Robert C. Cantu is on call amid football’s concussion crisis: congressional hearings, courthouses, NFL meetings, helmet safety panels, operating rooms, research labs, television studios, film documentaries. In the 45 years since he became a neurosurgeon in Boston, Cantu has become a fixture on the front lines of a public health campaign that is reshaping the way football in America is played. Yet for all his contributions, Cantu’s roots in the field have grown so tangled that his connections with parties on many sides of the concussion crisis have become emblematic of the conflicting interests in the football, helmet, medical, and scientific communities. Cantu has worked for and against the NFL. He has been paid to help set helmet safety standards for the National Collegiate Athletic Association while accepting tens of thousands of dollars to submit testimony for players suing the NCAA over head injuries. And corporations that Cantu has served or promoted have contributed more than $1.3 million to entities he helped to create, including a research center, concussion foundation, and charitable endowment. With football at a crossroads amid safety fears — at least six high school players died this year of brain injuries, an estimated 40,000 suffered head trauma, and the NFL agreed to pay $765 million to settle claims that more than 4,500 former players were exposed to brain damage — Cantu and the safety organization he helps guide, the National Operating Committee on Standards for Athletic Equipment, are under fire for their perceived failure to better protect athletes from brain injuries that researchers have found to be endemic to the sport. No one alleges that Cantu has placed his personal financial interests above his cause. Rather, some critics and supporters said his overlapping connections may have hampered his ability to achieve his goals. Cantu said in an interview that his decades-long effort to improve player safety has not been compromised by his complex web of relationships. He is alternately viewed as an esteemed physician who has aligned himself with competing interests in the concussion struggle and a headstrong crusader who is committed to accomplishing the most he can in the time he has left. “I’m thrilled with the work I’m still doing,’’ said Cantu, 75. “My work fortunately generates enough for myself and my family so that I can spread myself to these other organizations, not for a fee in every case. Cantu and NOCSAE have come under scrutiny as child protection advocates decry the organization’s failure to establish specific safety standards for youth football helmets. Safety technology innovators, in fact, claim that NOCSAE has actually made it harder to market some products aimed at better protecting football players. NOCSAE has long been primarily funded by the nation’s football helmet manufacturers, and those companies generally have opposed allowing aftermarket safety products — primarily impact sensors that measure hits to the head and soft-shell caps aimed at cushioning the blows — to be added to their helmets, citing liability issues. Cantu has served for 17 years as a vice president of NOCSAE. The nonprofit was formed in 1969 by a coalition of athletic organizations, health interests, and sporting goods manufacturers to improve helmet safety after 36 college and high school football players died the previous year of neck and head injuries. Many of those injuries involved skull fractures, which rarely occur today. Helmet executives have long served on NOCSAE’s board of directors and now control four of the board’s 16 votes. Several members of Congress, citing the apparent conflict and other concerns, have advocated shifting authority over helmet standards to the US Consumer Product Safety Commission if the current system does not soon produce substantial improvements. Some industry leaders also believe the NOCSAE system is flawed. The organization sets voluntary safety standards and testing procedures for manufacturers, then licenses them to certify to football’s governing bodies that their products meet NOCSAE standards. “It’s a self-certification process,” said Mike Oliver, NOCSAE’s executive director and general counsel. The entire arrangement strikes many in the field as too cozy. “The system should be independent and not funded by the helmet manufacturers,’’ said J.C. Wingo, a former president of Riddell, the nation’s largest helmet maker. Wingo now leads a company that develops sports safety products. He said NOCSAE has responded too slowly to the concussion crisis. “We need to raise the standards if we’re going to have better equipment,’’ Wingo said. Cantu and Oliver said helmet manufacturers do not exert undue influence over policy. If so, Archie countered, NOCSAE would have established safety standards for youth helmets by now. Cantu announced in January 2011 that NOCSAE would try to create such standards, which many safety advocates consider long overdue. Many researchers say current youth helmets are potentially hazardous to children whose necks are not strong enough to support them. They say children are at greater risk of suffering head and neck injuries from the “bobblehead effect’’ of getting hit while wearing large helmets. Oliver said NOCSAE cannot stop helmet sales. Under the current system, the sport’s governing bodies, such as the NCAA and the National Federation of High Schools, could ban helmets that were not designed to the satisfaction of those organizations. Jon Butler, the executive director of Pop Warner football, which serves more than 200,000 children, said Pop Warner helmets, made by Schutt, “are held to the same standards and rigorous testing processes as adult-sized helmets. Meanwhile, Pro Football Hall of Famer Mike Haynes, who played for the Patriots from 1976 to 1982, expressed concern that his 9-year-old son, Rex, might suffer a concussion playing football, as his 14-year-old son, Tate, did when he was younger. Cantu acknowledged that current youth helmets are too heavy for many children. He has recommended that no one under age 14 play tackle football because of the risks to children’s developing brains. Cantu said NOCSAE has spent millions of dollars studying how to create a better youth helmet and has developed a draft proposal for review. The challenges are complex, involving not only the size, weight, and padding of a helmet but its ability to protect against various rotational forces that can lead to concussions. While trying to improve the standards, NOCSAE has awarded a number of research grants to entities connected to members of its board of directors and scientific advisory committee — a practice that critics have assailed as creating potential conflicts of interest. Duma said the potential conflicts caused him to resign from the scientific advisory committee, which Cantu chairs. “If you’re a paid consultant for a company and serving on a committee that is recommending a decision that could affect that company, that would never happen, for example, at the National Institutes of Health,’’ Duma said. Cantu said the organization offered members of his committee a “one-time’’ opportunity to apply for grants. “We had tremendous pressure to try to improve our standards and those were individuals who had labs in place that could do it,’’ he said. Oliver said NOCSAE’s board members and contractors are required annually to disclose conflicts of interest. Such was the case, Oliver said, when NOCSAE granted $300,000 from 2009 to 2010 to a research institute at Boston University — the Center for the Study of Traumatic Encephalopathy — that Cantu cofounded and continues to lead. NOCSAE has since paid Cantu at least $148,000 for leading its scientific advisory committee. The grant application was submitted by one of Cantu’s BU colleagues, Dr. Ann McKee. She has pioneered post-mortem brain studies linking chronic neurological diseases to repeated head traumas in sports. Asked if the grant could be viewed as an apparent conflict, Cantu said, “Well, yeah, in a way. NOCSAE gave the center a couple of hundred thousand dollars, but that’s out of millions they have given’’ for research. As for his other purported conflicts, Cantu does not dispute that he worked both sides of the NFL’s legal fight. While he served as a senior adviser to the NFL’s head, neck, and spine committee, the NFL made a $1 million grant to the BU center he helps to lead. Cantu also was subsequently paid for a briefing he gave lawyers for players who were suing the league. The connection was first reported for ESPN by the authors of “League of Denial,’’ a report on the NFL’s stubborn response to evidence that players can develop chronic brain disease from repeated head traumas. Cantu, who is in demand among lawyers seeking medical testimony on sports-related brain damage, previously had raised eyebrows by advising the NFL players union on concussion issues. He said the only payments he has received from the NFL and the players union have been reimbursements for travel expenses. Cantu said the NFL expressed its displeasure to him about his legal work for the players and has not directly contributed again to the BU center. However, the National Institutes of Health, which received $30 million from the NFL for concussion research, recently announced it will grant $12 million of that money to the BU center. As part of another tangled relationship, Cantu recently accepted more than $38,000 to provide expert testimony for players suing the NCAA over alleged sports-related brain injuries. The role made him a paid critic of the NCAA’s attention to safety standards at a time when he was helping to set safety standards for NCAA helmets. Cantu expressed little regret over working different sides of the issue. It doesn’t surprise him that both sides want access to his expertise. Nor does Cantu regret another close relationship — this one with a helmet maker while he was helping to set helmet safety standards. Two years later, while Cantu remained a Xenith adviser, the company pledged to donate in perpetuity $1 for every X1 helmet it sold, plus some matching funds, to the Cantu-Guskiewicz Research Endowment for Sport Concussion, administered by the National Athletic Trainers’ Association. Cantu formed the endowment with Kevin Guskiewicz, a concussion researcher at the University of North Carolina. They each donated $10,000 to launch the charity, which aims to finance concussion research projects by college graduate students. Xenith has since contributed more than $30,000 to the cause. Cantu said he has never personally taken money from Xenith or any helmet company. He said he asked Xenith to stop using his name to promote its helmet several years ago, and a company spokeswoman confirmed that his advisory role with Xenith ended in 2010. Meanwhile, leaders of two impact sensor companies expressed concern that the BU-affiliated Sports Legacy Institute, which Cantu founded with former professional wrestler Chris Nowinski, accepted their money last year to sponsor a research project without disclosing that Nowinski and a board member had a financial interest in an impact sensor. That sensor was developed by Cambridge-based MC10, a rival of several other sensor companies that contributed to the project. The criticism involves Cantu, Nowinski, and Isaiah Kacyvenski, a former NFL player who has served on SLI’s board since 2011. Kacyvenski, who helped invent MC10’s Checklight impact sensor, was a manager of the company when SLI received at least $25,000 from MC10 and five other sensor companies for the institute’s “Hit Count’’ project. Nowinski, who roomed with Kacyvenski at Harvard, was serving as a paid consultant to MC10. And Cantu, SLI’s medical director, soon was promoting Checklight, describing the sensor to the Globe in July as a “very important’’ device for tracking the number of hits a player absorbs — a feature that other sensors provide. “At $149.99, Cantu said, Checklight is more affordable than other high-tech options on the market and will be used more often,’’ the Globe reported. Some of Checklight’s rivals said SLI’s ties to MC10 and Cantu’s public praise for its product gave the appearance that the institute favored one sensor over the others. “It’s a blatant conflict of interest,’’ said Danny Crossman, whose company developed the Shockbox sensor and contributed to the SLI project. Crossman’s sensor also is listed at $149.99. Cantu said he has no financial relationship with MC10 or Reebok, which markets Checklight. “But I cannot deny that it could appear to be a conflict,’’ Cantu said of the institute’s connections to MC10 and Checklight. As for Nowinski’s ties to MC10, he said SLI’s board of directors approved the arrangement and determined “it was a conflict that could be managed.’’ Nowinski said he did not seek to renew his consulting contract with MC10 when it expired this year. For Cantu and Nowinski, opportunities to participate in concussion-related initiatives have abounded since they emerged in the past decade as leaders of the movement to curb traumatic brain injuries. They met when Cantu, chief of the neurosurgery service at Emerson Hospital in Concord, began treating Nowinski for head injuries he apparently suffered as a professional wrestler and football player. Countless athletes have benefited from Cantu’s work. But critics say he and NOCSAE could help many more by clearing a path for new safety technology to reach a broader market. The roadblocks, according to the critics, include NOCSAE rules that favor the interests of helmet manufacturers over aftermarket add-ons such as sensors and soft-shell caps. Many researchers say concussions can be reduced by using sensors to gauge the frequency and severity of hits to a player’s head. The sensors send alerts to hand-held devices on the sidelines. “The technology is absolutely fabulous,’’ said Brooke de Lench, who recently produced and directed “The Smartest Team,’’ a television documentary aired by PBS that examines how to make football safer for high school athletes. After de Lench outfitted the football team at Newcastle High School in Oklahoma with impact sensors, players experienced only two concussions during the 2012 season, down from 16 in 2011. The sensors were credited with raising awareness about the frequency of hits to the head and motivating teams to try to limit them. Many other high school and college teams have reported similar results with sensors and soft shells, such as Guardian Caps, which add padding to the outside of football helmets. But relatively few players have access to the products because of certification and liability concerns. Last summer, as teams prepared to buy equipment for the 2013 season, NOCSAE issued a statement warning consumers that adding any product to a helmet could void the helmet’s certification by the helmet makers — certification that football’s governing bodies require. Riddell, which markets its own helmet model equipped with an impact sensor, then warned consumers that adding “third party aftermarket accessories’’ could render the helmets “illegal for most organized play,’’ according to a company statement. Riddell contends that adding aftermarket products to its helmets might alter their integrity and performance. Officials at high schools and colleges across the country said they took the warnings to mean their schools would bear the legal liability if a player suffered a head injury in a helmet fitted with an extra safety product. De Lench said the warnings dealt “a crushing blow’’ to the Oklahoma team as it prepared to outfit players with the sensors for a second season. Officials at other schools related similar reactions. The situation has become so thorny that Gregg Hartley, a representative of the helmet manufacturers who serves as a NOCSAE vice president, recently launched an effort to shift authority for setting some equipment standards from NOCSAE to the American Society for Testing and Materials. However, that process could take months, if not years. Cantu and Oliver dispute that NOCSAE has been a barrier to safety products reaching the market. Meanwhile, Cantu continues to wage his campaign to reduce sports-related brain casualties. Citing the NFL’s massive settlement, he said he considers his work as a legal expert in concussion-related court cases — at $800 an hour in a recent case — a path toward achieving his goal. Others said the best change would involve overhauling or replacing NOCSAE.